For those who like Jazz and Bebop, one man you are sure to have heard of is the legendary Joe Pass. His incredible fluid way of playing guitar made him an influential artist for anyone who wanted to get into jazz guitar. But this guitar isn't boxed into the corner of Jazz; it will happily turn its hand to many styles that warrant a smooth, warm and easy-going tone. Specially designed and constructed with only the highest quality components, and taking plenty of inspiration from the legendary PAF humbuckers of the 1950s, these ProBucker pickups sound simply phenomenal. Sitting in the neck position you have a ProBucker-2 which delivers a vintage, PAF-like neck tone, complete with rich mid-frequencies, that's simply perfect for those creamy guitar solo's PAF's are renowned for. At the bridge you have a ProBucker-3. This pickup is as stark and growly as you could want a bridge 'bucker to be, and sounds just as good clean as it does with high emounts of gain. 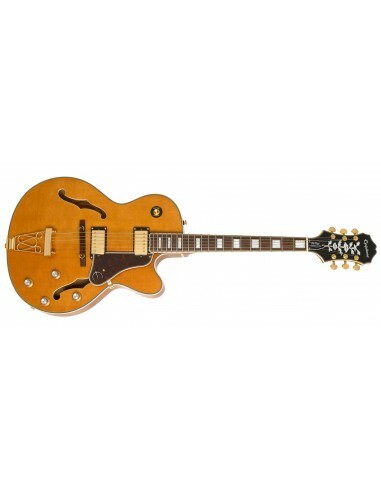 Both of these pickups work phenomenally well when combined with the natural resonance and sustain of the Epiphone Joe Pass Emperor-II's semi-hollow body, making the guitar suitable for a wide range of musical styles, especially Jazz and it's many sub-genres. As if that legendary PAF-like sound alone wasn't quite enough, the electronics in the Epiphone Sheraton-II Pro give you even more tonal options in the form of coil-splitting. Simply raise the corresponding Volume Control (Neck or Bridge) and it will split the humbucker into a single coil pickup, giving you plenty of tonal combinations to play around with. True to the design of Joe's original Gibson ES-175, the Emperor-II Pro features a Select Spruce top with hand-scalloped bracing and sound post - making it an Archtop guitar in the truest sense. Also featuring a Laminated Flame Maple back and sides, with stylish Ivory and Black binding on the top, back, and fingerboard, this guitar oozes sophistication from every pore. It's safe to say that the rock solid nickel hardware (gold finished) and vintage style gold scroll tailpiece are the perfect aesthetic finishes for this guitar, as they take inspiration from those vintage Kalamazoo-made archtops of yesteryear. This guitar also comes complete with a Pau Ferro floating bridge with thumbwheels (for easy height adjustment), and a set of professional-grade Grover Rotomatic 18:1 ratio tuners, for fast, accurate, and worry-free tuning. Call into your local PMT Store today and request a demonstration of this phenomenal guitar with one of our resident product experts - you won't regret it. Alternatively, order this guitar online today and make use of our fantastic range of Home Delivery and In-Store Pickup options.